Home › Fix My Smile › What are the Best Denture Alternatives available in the Ozarks? Denture Care has been around for centuries. Why hasn’t anyone invented better dentures? The fact is, there is a 21st century alternative to replacement dentures, and it is Exclusively Provided by Thayer Dental Care as Teeth Tomorrow® Ozarks. Conventional Dentures may be removable or fixed. Removable dentures are taken out of the mouth at night for cleaning and disinfecting, then inserted and held in place using denture adhesives. Fixed dentures are only removed by your dentist. They are supported by a series of dental implants to which the denture is attached. The convenience of not having to remove dentures for daily cleaning has led to the increasing popularity of implant supported dentures. However, implant-supported denture alternatives with acrylic gums and porcelain teeth are much harder to maintain over time. Fixed replacement dentures require a higher level of daily attention because they are made from materials that attract plaque, stains, and odors. Also, the older these dentures become, the more prone they are to chipping, breaking, and overall failure. For patients seeking a truly permanent solution, there are no “better dentures” made from acrylic and porcelain. The material is the problem. That’s why Thayer Dental Care provides the best in denture alternatives – the Teeth Tomorrow® Prettau® Zirconia full-arch dental implant bridge. 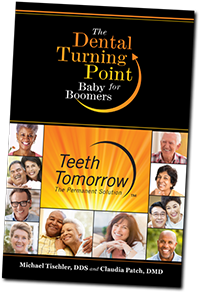 While all dentures will eventually need to be replaced, this permanent solution is designed to last a lifetime. Prettau® Zirconia is both highly durable (to eliminate wear from biting, chewing and talking) and just flexible enough to be sculpted and shaped to your specific requirements. It is non-porous and has a high-density, producing a bridge with a smoother finish than those made from other materials. Your finished bridge resists stains and doesn’t absorb odors or attract plaque and bacteria. Take the first step toward changing your life – Enjoy eating the foods you love – Stop worrying about denture mishaps. Contact Dr. Samir Patel today for a Free Consultation!